From The Daily Cal­i­forn­ian, Tues­day, Octo­ber 8. Click here to go direct to that link, or here for the Berke­ley­Blog ver­sion. The first thing we cover, using basic chem­istry that has been well known to sci­ence for over 100 years,is that end­lessly emit­ting green­house gases will warm the planet. We have known sci­en­tif­i­cally since the 1990s that cli­mate change is already impact­ing ecosys­tems, crops, and both human and envi­ron­men­tal health. We have known for almost two decades that we have already warmed the planet by one degree Cel­sius, and that at two degrees Cel­sius, dra­matic changes to the earth will be every­day events. Instead of becom­ing a ral­ly­ing cry for inno­va­tion as were the responses to dis­ease (“the war on polio”), food, poverty and nutri­tion (“the Green Rev­o­lu­tion”) or the desire to reach space (“the Apollo pro­gram”), cli­mate change has become, arguably, the most divi­sive issue in the United States. Where we used to see chal­lenge as an oppor­tu­nity, this one, inex­plic­a­bly has become a proxy-​​war for eco­nomic inse­cu­rity and class division. After all, the U.S. Envi­ron­men­tal Pro­tec­tion Agency, launched under Repub­li­can Pres­i­dent Nixon and passed through House and Sen­ate Com­mit­tees in 1970. TheClean Air Actbecame law in 1970, where it passed the Sen­ate with­out a sin­gle ‘no’ vote. Only one rep­re­sen­ta­tive voted against the bill. Against expec­ta­tions, George H. W. Bush fea­tured the envi­ron­ment promi­nently in his cam­paign, and in 1988 his pres­i­dency saw an expan­sive update to the Clean Air Act which the Sen­ate passed with bipar­ti­san support. Since then, how­ever, things have dete­ri­o­rated, with atten­tion and invest­ment in envi­ron­men­tal qual­ity at local, to national, and at global lev­els becom­ing the ‘third rail’ of U.S. politics. This is where local action by Cal stu­dents is so crit­i­cal. 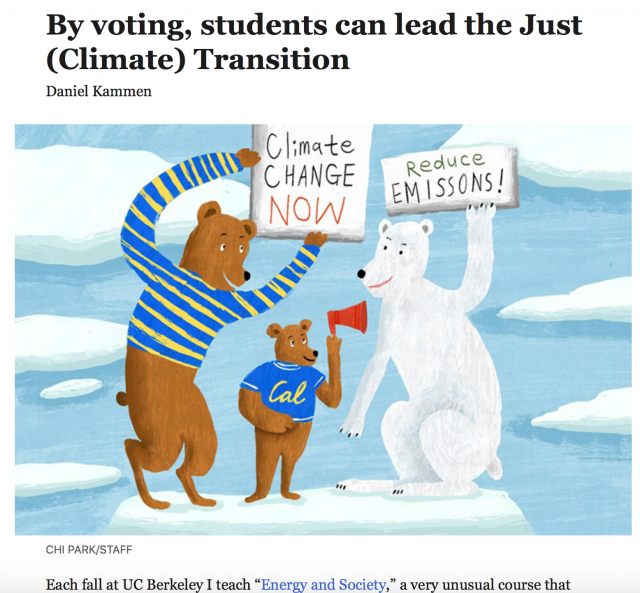 As the acknowl­edged top pub­lic uni­ver­sity in the world, Cal stu­dents, staff, fac­ulty and alumni have helped to make Cal­i­for­nia the remark­able energy and cli­mate leader that it is, but have also found a myr­iad of ways to spread those expe­ri­ences across the coun­try and around the world. That reach has never been more impor­tant than now as we approach the most impor­tant mid-​​term elec­tion in decades. At the Cli­mate Action Global Sum­mitin San Fran­cisco last month I heard an approach that harkened back to the bipar­ti­san­found­ing of the U.S. EPA.. This new vision was stated most clearly and elo­quently not by politi­cians, ora­tors, or sci­en­tists, but by high-​​school and col­lege stu­dents who gath­ered in a series of youth sum­mits orga­nized within and around the offi­cial meetings. What is most ironic is that cli­mate change is actu­ally one of the most inter­est­ing issues and oppor­tu­ni­ties we as a coun­try have ever faced because its solu­tion cre­ates eco­nomic oppor­tu­ni­ties. Every bit of coal, gas, or oil that we replace with energy effi­ciency and clean energy is a shift away from min­ing resources to invest­ing in com­pa­nies and invest­ing in peo­ple. After all, when the fuel is free, cre­at­ing new tech­nolo­gies and build­ing social insti­tu­tions and poli­cies are all ways to invest in our­selves and to both cre­ate employ­ment and to use data and insti­tu­tions to grow the econ­omy. My lab­o­ra­tory here at UC Berke­ley has been research­ing and doc­u­ment­ing the green jobs ‘div­i­dend’ and has been doing work witha series of stu­dents, many of whom are alumni of ‘Energy and Society’. The clean energy oppor­tu­nity is aligned with core val­ues – at least those stated on paper – by both the Demo­c­ra­tic and Repub­li­can par­ties. Instead of one of the few places for bipar­ti­san action, how­ever, it has become an area where even the most basic facts are end­lessly debated. As research launched at Berke­ley has shown, invest­ments in mass tran­sit and for those who need cars, elec­tric vehi­cles are not only cheaper to oper­ate than gas-​​powered cars, but they also lead to dra­matic reduc­tions in urban air pol­lu­tion, a hall­mark of Cal­i­for­nia poli­cies since the 1970s. As inequal­ity has grown across Amer­ica, UC-​​based research has con­tin­ued to high­light the many exam­ples of well-​​meaning poli­cies (such as sub­si­diz­ing elec­tric vehi­cles for the afflu­ent) that exac­er­bate the grow­ing national eco­nomic divide. Instead, efforts launched here to invest in more afford­able homes and apart­ments by inte­grat­ing energy effi­ciency, solar, power, and both bet­ter mass-​​transit and elec­tric vehi­cles for low-​​income Cal­i­for­ni­ans offers a sus­tain­able path to social equity. Of par­tic­u­lar note is that California’s land­mark cli­mate leg­is­la­tion, SB32which gov­erns our state decar­boniza­tion from 2020 – 2030, calls for 35% or more, of our green­house gas cap and trade rev­enues (now in the $10 billion/​year range) to be spent on under­served minor­ity com­mu­ni­ties. I’ll wager that when we look back this bill, it will be this invest­ment in social jus­tice, not the cli­mate tar­get that will be its most impor­tant legacy. This is where the Cal stu­dents can play a most imme­di­ate and hugely impact­ful nation­wide role: by reach­ing out to fel­low stu­dents, par­ents, and friends both across Cal­i­for­nia and across the coun­try to high­light how dou­bling down on equi­tableclean energy projects offers a rare and gen­uine ‘win-​​win’ at a time when the coun­try is more divided than ever. Daniel Kam­men is pro­fes­sor and chair of the Energy and Resources Group, and Pro­fes­sor in the Gold­man School of Pub­lic Pol­icy, and in the Depart­ment of Nuclear Engi­neer­ing. He served in the Obama Admin­is­tra­tion as Sci­ence Envoy for the State Department. Next post: KQED Newsroom with Thuy Vu — Climate Change Solutions.